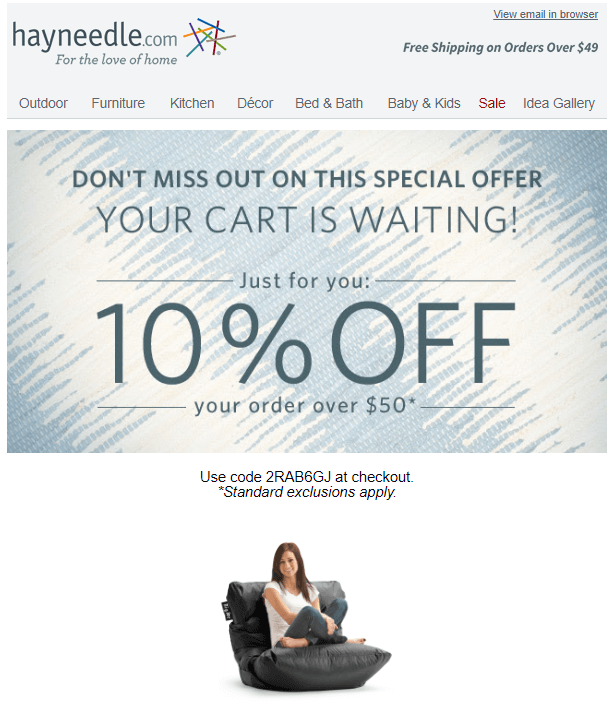 Are you sending out abandoned cart emails when your visitors leave something behind? If not, you’re missing out on huge amounts of income! 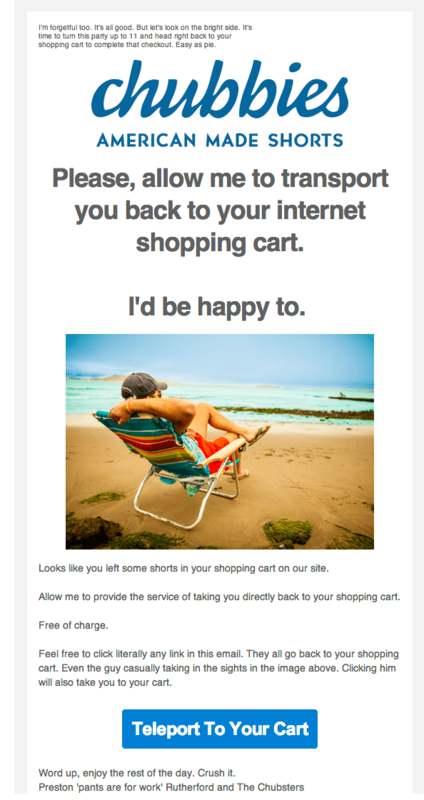 In this post, we share some great abandoned cart email examples to inspire you. 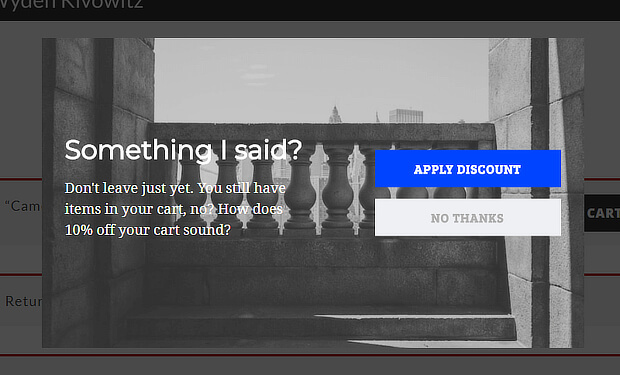 Why Send Abandoned Cart Emails? The thing is, about 75% of people who abandon their carts usually plan to come back, so if you’re not sending abandoned cart emails to jog their memory, you’re leaving serious money on the table. Salesforce data show that 60% of shoppers returned to make a purchase within 24 hours of receiving personalized emails after abandoning their shopping carts. In the past, we’ve discussed ways to reduce shopping cart abandonment. One of the key tactics is to remind shoppers there’s something in the cart with an abandoned cart email strategy. But, what are the emails supposed to look like? 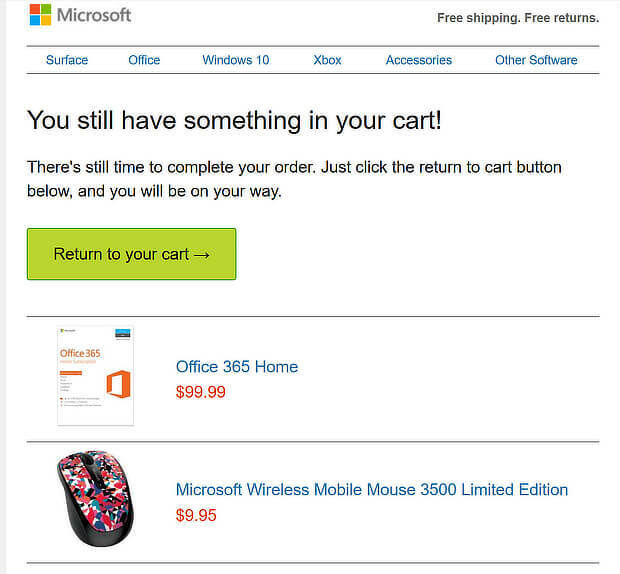 We’ve scoured the web to collect the best examples of abandoned cart emails we could find. For each, we’ll let you know what’s good, and what we thought could be better. 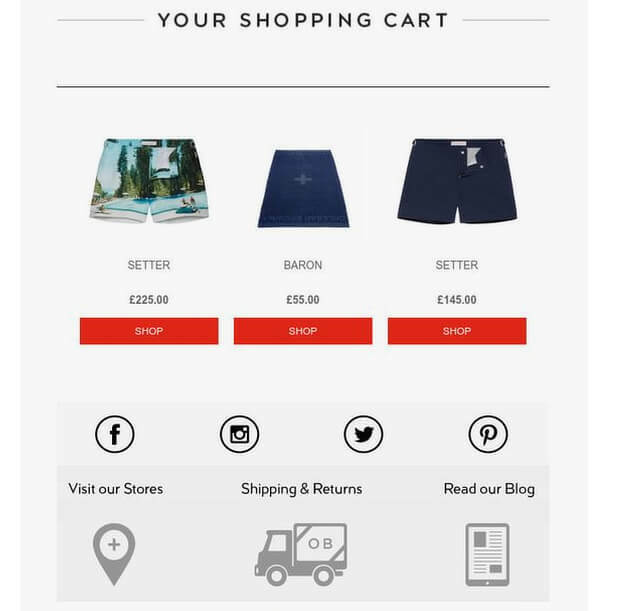 By the end of this post, you’ll be able to use these examples to create your own abandoned cart email templates so you can start to recover revenue from shoppers with items left in the cart. As the world’s largest online retailer, following Amazon’s lead is a good bet. 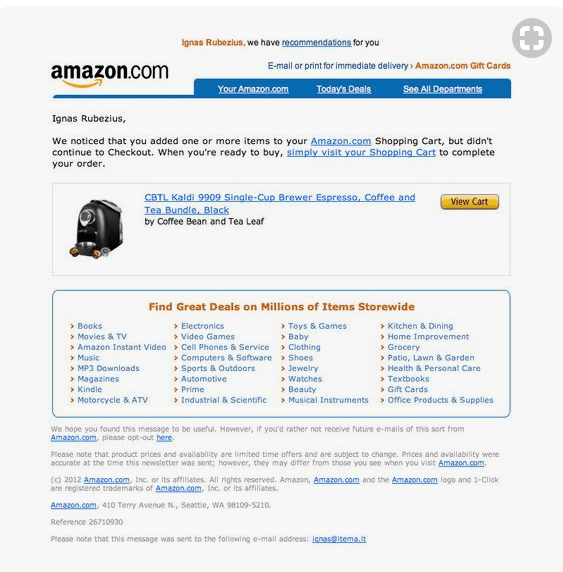 It’s pretty clear that Amazon uses a simple abandoned cart email template that works for any of their stores. By the way, they also send abandoned search emails related to what you’ve been looking at. This is a very simple email that gets straight to the point. It reminds you where you were shopping. It includes a photo of the item left in the shopping cart as a reminder. There’s a link to the item so the recipient can head straight to checkout, removing obstacles to completing the purchase. The bottom of the email is a mess. Is there really a need for all of those Amazon links? We’d love to see an incentive for completing the purchase, like an additional discount. However, this approach clearly works for Amazon. 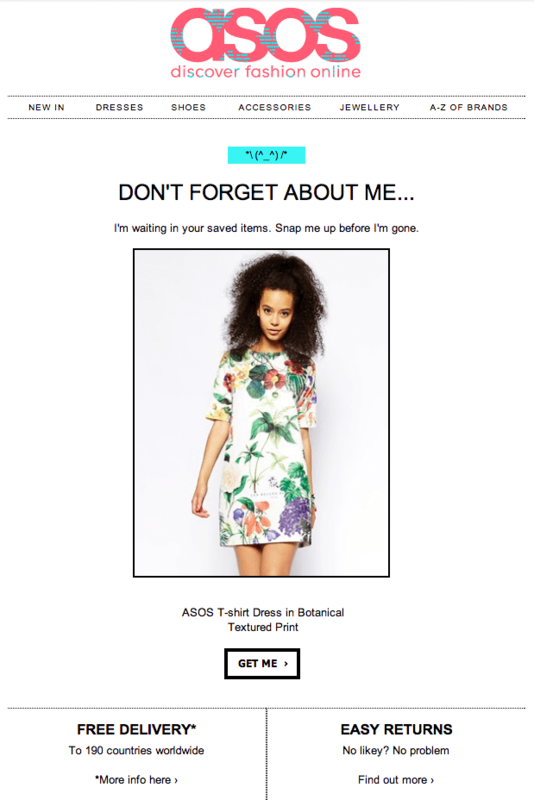 The abandoned cart email template from Asos is also pretty simple. ASOS has nailed brand recognition with this email. It looks very similar to the store’s homepage. The messaging is also on-brand, with some playful humor in the headline and copy. The ASOS marketers clearly know their buyer personas. The email includes a picture of the item in the cart to jog the recipient’s memory with a visual. The email reminds recipients that there’s free delivery and it’s easy to return items. This removes the risk of completing the sale, which will help with conversions. To be honest, we liked everything about this email from ASOS. 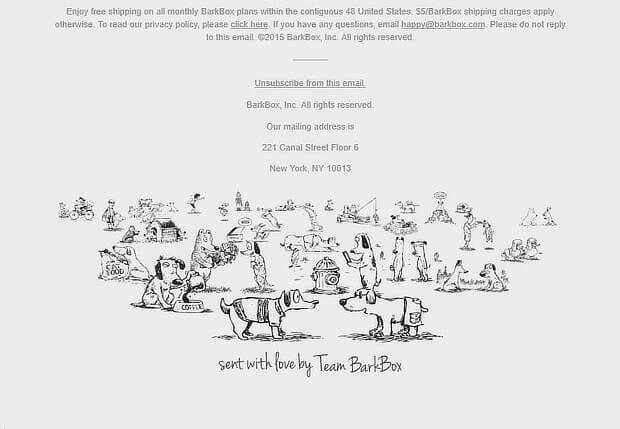 Barkbox brings the fun in with this abandoned cart email example, and we think it works – mostly! The GIF of an excited dog receiving the order is absolutely right for the audience and guaranteed to get attention. There’s a reminder of what’s inside a typical Barkbox to reawaken recipients’ interest. The copy is cute: “show your dog some ruv” will melt any dog owner’s heart. This is mirrored by the cartoon drawings of dogs at the top and bottom of the email. The email includes 2 identical calls to action (CTAs) at the top and bottom of the email. There’s a cart expiry warning to trigger action based on urgency, which is usually a good marketing tactic. One possible improvement would be to show the actual Barkbox the recipient ordered to make it more personal. In eCommerce, personalization helps to make sales. Does beachwear have anything to do with sci-fi? If you believe this example from Chubbies, there’s definitely a link. Chubbies clearly knows its audience. The words “transport” and “teleport” in the email subject line, copy, and CTA are designed to appeal to them. There’s humor throughout the copy in encouraging readers to go back to the cart. You can’t miss the CTA. There’s an eye-catching image early in the email, related to Chubbies’ products. 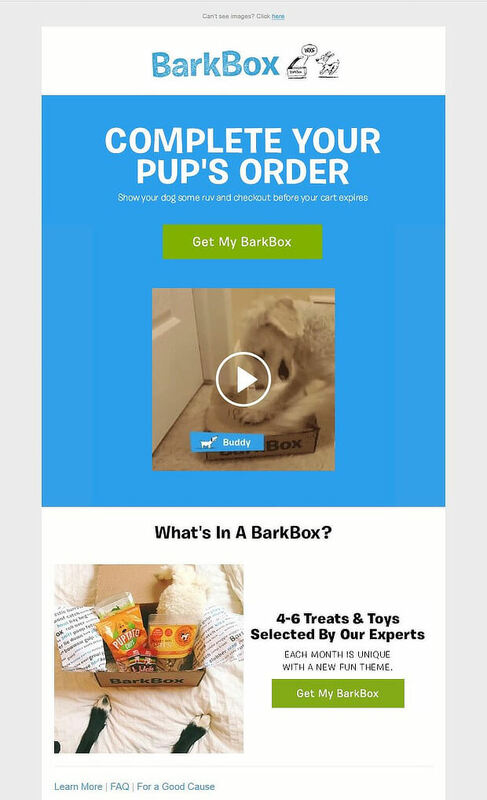 Like the Barkbox example above, this would have been even better with a specific photo of the item in the recipient’s cart, but generally, this email works. 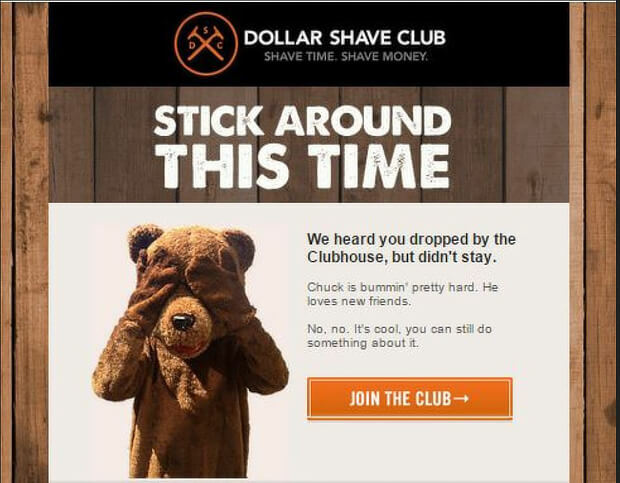 Dollar Shave Club is known for excellent marketing, so it’s no surprise that it’s one of the most appealing of our abandoned cart email examples. The bear covering its eyes is intriguing and will encourage recipients to read the email. The copy is written in every day, laid-back language, which is perfect for the company’s audience. 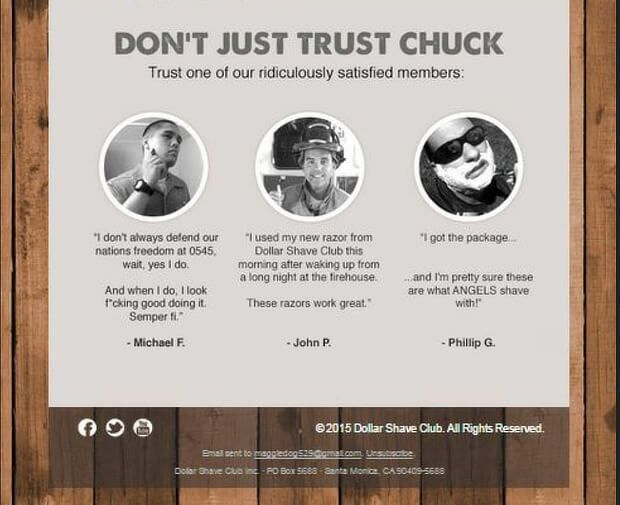 This carries through to the customer testimonials, introduced with a “Don’t Just Trust Chuck” subhead. Overall, there’s a sense of fun and personality which really appeals. We’d like to see Dollar Shave Club could add another CTA under the testimonials for recipients who read that far down. Glossier’s got a pretty cool abandoned cart email, as you’ll see. Glossier is upfront about the fact that this is an automatically triggered email and plays with that in the copy. The eye-catching brand image is designed to get attention. It’s short and to the point, with an explicit link to the shopping back near the top of the email. The “Get back in there” CTA is amusing. We’d suggest testing if including an image of the item that’s in the cart makes a difference to conversions and sales. 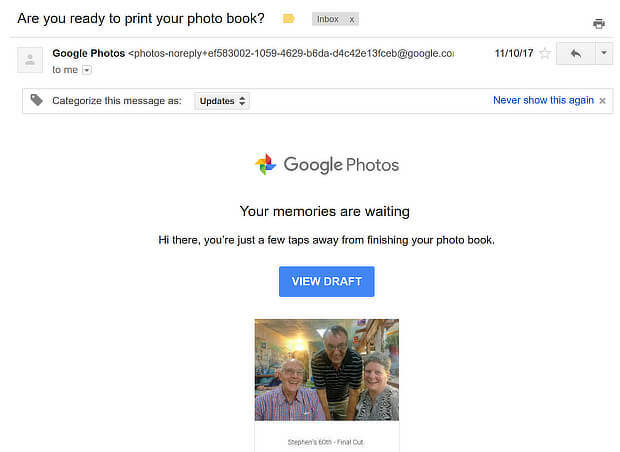 Google is known for keeping things simple, and this cart abandonment email for a Google Photo Book is no exception. The email includes a photo from the book, and photos always get attention. The subject line reminds the recipient of the next stage in the process. The CTA is simple and clear. This email is almost too minimal. A bigger photo would get more attention. Home furnishings retailer Hayneedle knows how to sweeten the deal for shopping cart abandoners. The email highlights an incentive discount in the subject line and first image. There’s a reminder of what’s in the cart. The CTA highlights the benefit of completing the order. Their images of related products are on point – exactly what someone considering purchasing this item might want to look at. Actually, we liked everything. This cart abandonment email works. Retailer J. 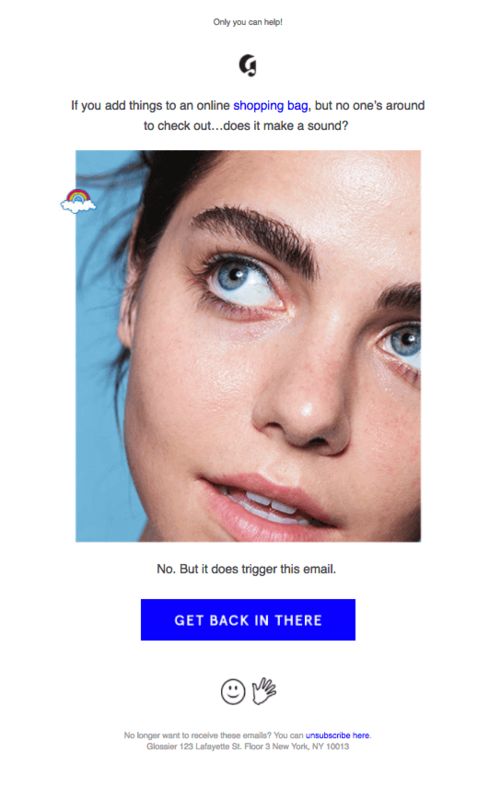 Crew goes for simplicity with this abandoned cart email example. 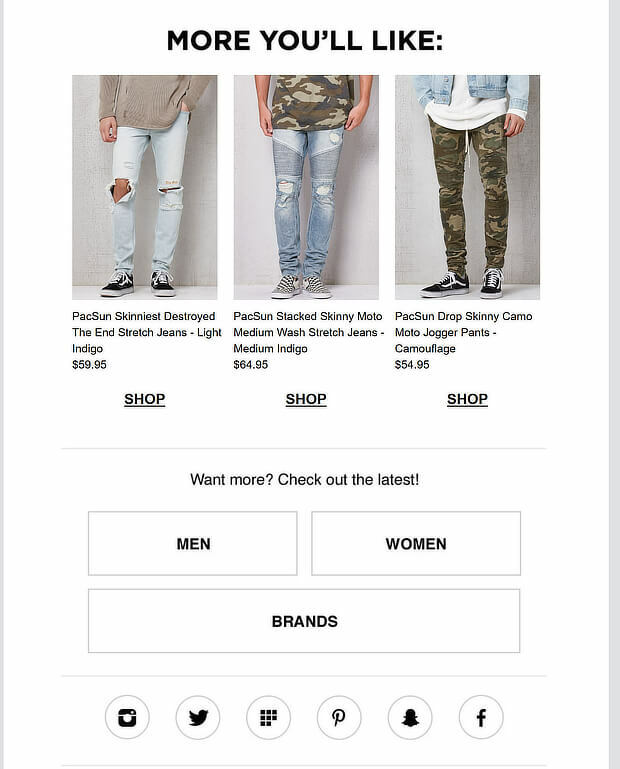 The email mimics the look of the main site, with menu links for the main shopping categories. There’s a large picture of the item in the cart to remind the recipient what they were buying. The words “shopping bag” in caps are another instant reminder. The positive reinforcement of “Nice picks, btw” is designed to appeal to the shopper’s vanity in a small way. 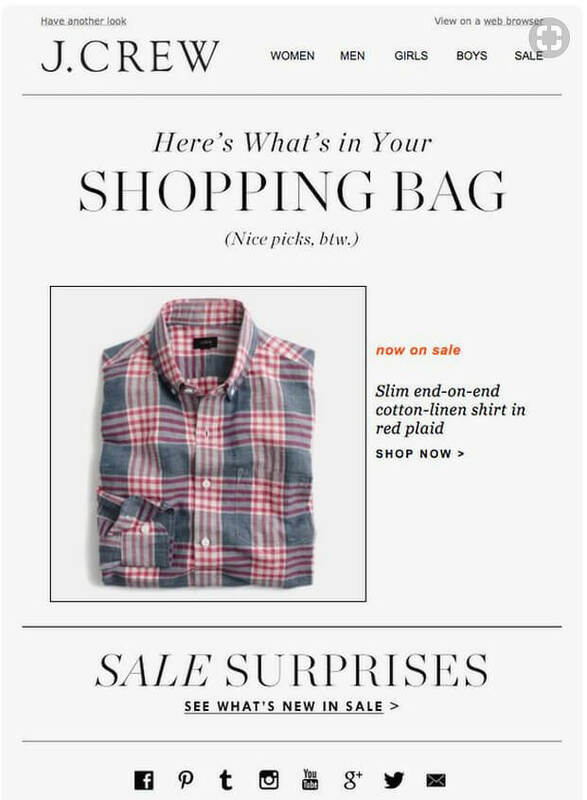 The email tries to entice recipients by mentioning other items on sale. It could have been useful to mention a shipping incentive or show related items from the sale. 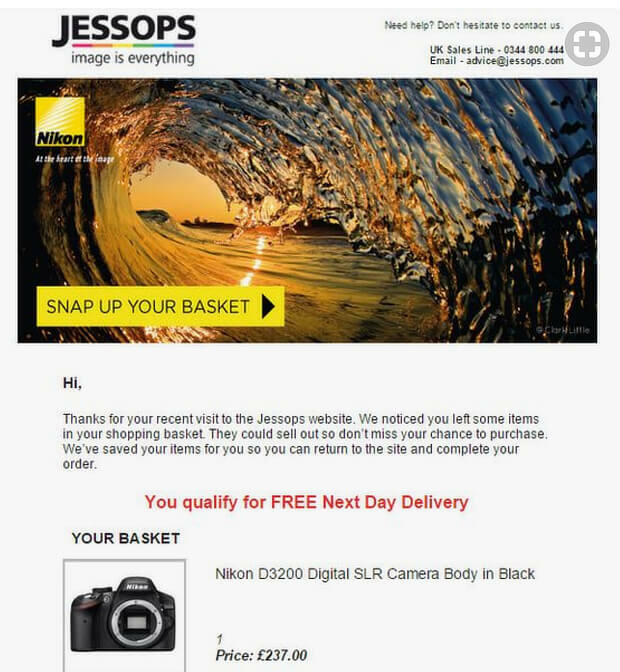 As you’d expect, abandoned cart email examples from photography company Jessops take a more visual approach than most. Killer images – every version of this we’ve seen has an eye-catching image right at the top. The “snap up your basket” CTA is a photography pun that will appeal to the audience. 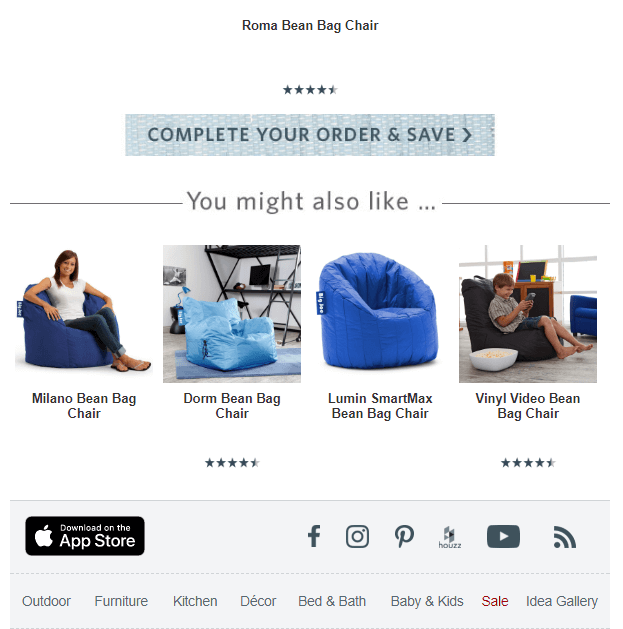 The email includes images of the items in the basket, followed by a regular CTA. There’s a reminder about free delivery as an incentive to complete the order. 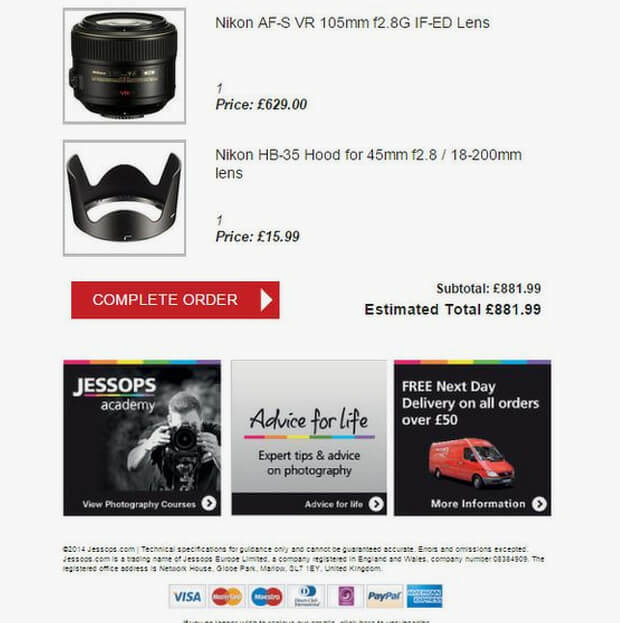 The bottom of the email includes boxes highlighting other Jessops Academy features, and multiple payment options. Both of these may remind recipients why they were shopping there in the first place. It would have been good to use the shopper’s name in the email to get their attention even more. Links to the Jessops Academy and, presumably, the blog, seem wasted in an email going to someone who hasn’t completed a purchase yet. This reminder from the Microsoft Store is pretty minimal. There’s nothing to distract the recipient. The copy is short and to the point. There’s a visual reminder of the item in the cart. The abandoned cart email features a single, clear, CTA. There’s no incentive to complete the purchase, perhaps because this isn’t an expensive item. 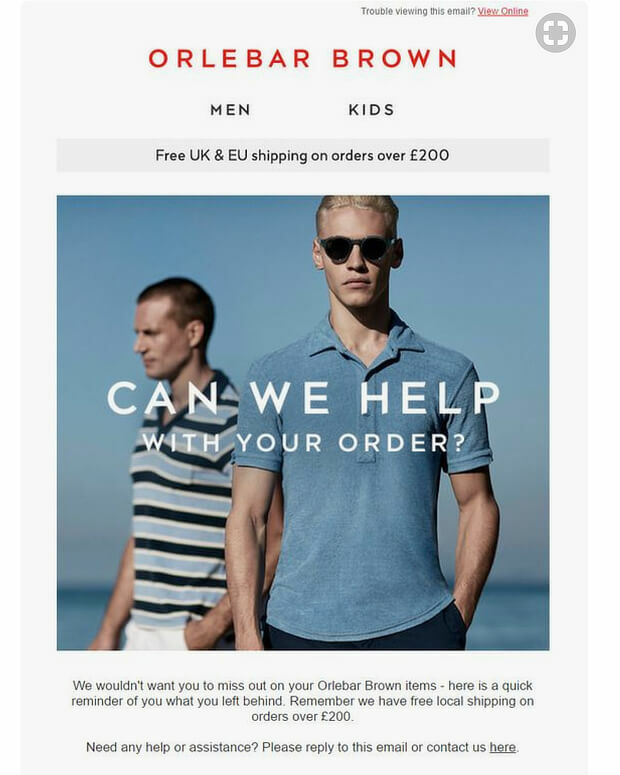 Here’s an example from clothing retailer Orlebar Brown. The main image is similar to images on the company’s website, reinforcing the brand. There’s a clear reminder of what’s in the cart. It shows where to get shipping and returns information. The “Shop” CTA seems a little dull, and could easily be replaced by a single CTA going straight to the cart. 3 identical buttons is definitely overkill. 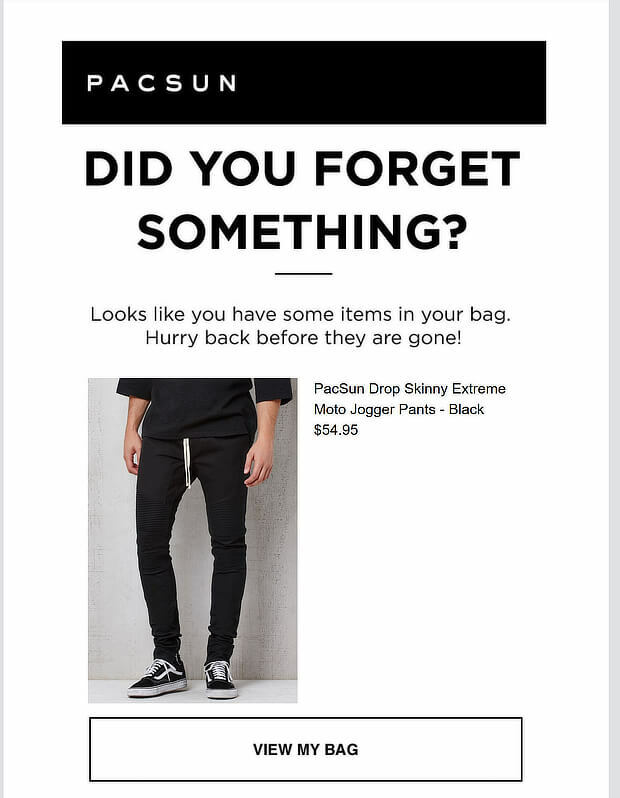 And here’s another example of an abandoned cart email from a clothing retailer, this time from Pacsun. You can’t miss the headline. There’s a large image of the abandoned item. The “view my bag” CTA uses curiosity to encourage recipients back to the site. The copy uses urgency with the words “hurry back”. There are links to related items the recipient might like. We think the links in the top half of the email should all go back to the cart. In the example we looked at, the first image linked to the product page. 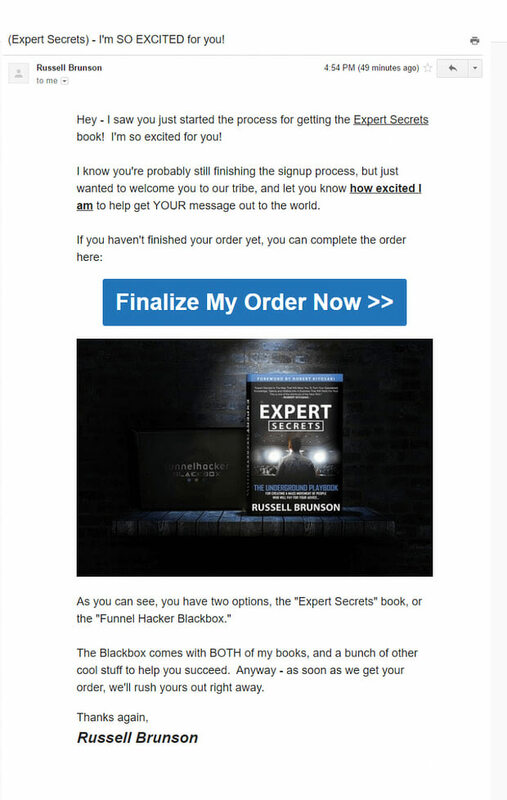 We haven’t yet had abandoned cart email examples for info-products, so here’s one from Russell Brunson for his Expert Secrets launch. There are four emails in the sequence, though we’ll look at the first one. The subject line appeals to the emotions, trying to generate excitement. The copy is friendly, just one person talking to another. There’s a big, bold, unmissable CTA to complete the order. The email copy reminds recipients what’s included in the deal. The email isn’t personalized, though that’s probably because the recipient hasn’t yet provided a name. Now you have some inspiration for creating your own abandoned cart email templates, here’s a way to recover even more of those abandoned carts with OptinMonster. You can use our page-level targeting feature to offer shoppers a discount when they return to the cart page. OptinMonster customer Scott Wyden used this technique to recover 21% of abandoned carts. To do this for your own online store, follow our instructions for creating your first campaign. Enable the Yes/No buttons and let the Yes button redirect to your coupon URL, to apply the discount. You can also boost your sales with an in-cart upsell popup, or improve average order value with these upselling tips. Be sure to check out our massive list of quick & simple tips to increase your conversion rates. And, for more tips, tricks, and tutorials don’t forget to follow us on YouTube, Facebook, and Twitter.